In the end of May, my husband Brad and I took a five day whirlwind trip to, of all places, Iceland. Iceland is actually a "hot" travel destination right now, given the reasonable prices (in part due to the collapse of the country's economy and significant unemployment). One of my good friends from college, Christina, wrote an article for the Travel Section of the Washington Post, which I have linked here. This article provided part of the inspiration for my trip. In addition to the food - Iceland is well known for its fish as well as an eclectic mix of traditional Nordic delicacies - we enjoyed our time there hiking, exploring glaciers and waterfalls, and of course the Blue Lagoon. Iceland has many excellent restaurants, cafes and bars. The city apparently has quite the nightlife and most weekend nights people in their 20s and 30s stay out until well past 4 AM. Because Iceland is so far north, and given the time of year we went, it is light outside for virtually all 24 hours of the day. I would actually think that Iceland would make a great site for an offbeat bachelorette party. Upon our arrival in Iceland, we went to one of Iceland's best known seafood restaurants for our first meal. Prior to checking into the hotel we made sure to exchange currency at an ATM at the airport by taking out Krona, Iceland's currency (the ATM machine provided four options: US Dollar, Euro, Pound and Krona). We later discovered that we had mistakenly taken out the equivalent of approximately $800 US Dollars in DANISH Krona, despite the fact that we were nowhere near Denmark. This mistake was actually salvageable, since we were able to actually use the Danish Krona in Iceland, anyhow. I don't think we fooled anyone as Danish tourists, however. 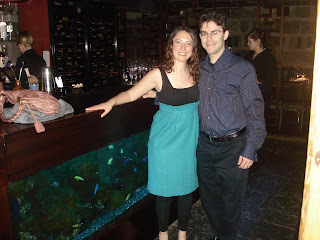 Our first lunch stop was the upscale and trendy Fismarkadurin (Fish Market). This restaurant had a very nice setting. We had the lobster bisque which I enjoyed, followed by sushi, which was reasonably priced. The fish quality was excellent, but I was by no means blow away. However the meal was enjoyable. My favorite restaurant of the trip, and the site of my husband's birthday dinner, was the beautiful Sjavarkjallarinn. If you have no idea how to pronounce that, you can just call the restaurant "Seafood Cellar," its English Translation. Seafood Cellar is known as Rekjavik's (the Icelandic capitol) best restaurant. We were not disappointed. The food at Seafood Cellar was some of the best fish I had ever had. We had the tasting menu, which was incredible. 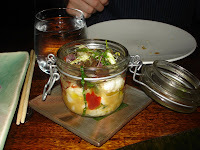 We had a lobster Thai coconut concoction, presented in a jar, that was stellar. In addition, we enjoyed the tasting selection of several (if I remember correctly - Salmon, Tuna and Monkfish) each prepared a different way. In addition, we were provided with Icelandic lamb. Apparently Iceland has a lot of sheep (like many other countries I have visited - Ireland, Australia, New Zealand) and has some of the best lamb in the world. The lamb at Seafood Cellar might be the best lamb I have ever had. 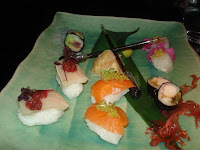 Our meal included some wonderful Icelandic sushi (also pictured). 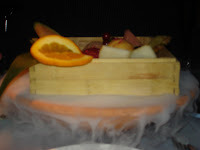 Finally, our desert was spectacularly presented on a bed of dry ice for a dramatic effect. 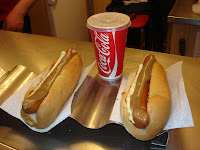 Another Iceland food tip is to stop by the local famous hotdog stand, Baejarins Betzu. This hotdog is great after a night of drinking. Order it with all of the toppings, no questions asked and it will satisfy any late night food craving. Apparently many famous people have visited this hot dog stand according to the photos by the stand, including the President Bill Clinton, a well known connoisseur of fast food. On our last night in Iceland, we ate at a traditional Icelandic restaurant, called Three Frakkar, which provided us with the opportunity to try some - weird food. 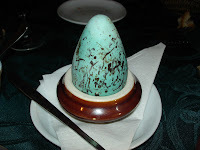 I ate what basically were speckled blue hard boiled eggs form an Icelandic seabird. In addition, we tried puffin - an acquired taste, which was not for me, and whale sashimi from non-endangered Icelandic whale. This was a one time thing for me - normally the environmental activist /animal rights type person - and something I feel guilty about (it tasted like tuna), so I can't really recommend this activity. I actually still feel bad about this, although I mist admit it was pretty mouth watering. In addition, reindeer was also on the menu, although we did not try it as well as many delicious varieties of locally caught fish. Iceland was a great whirlwind trip - and provided an interesting culinary experience, especially if you like fish.